I have been visiting Torridon for twenty five years and though it used to be nearly a 12 hour trek from the South Coast it is now (relatively speaking) on my door step; being less than 2 hours from our home on Skye. A midweek visit was planned well before I knew what the weather was going to be like. 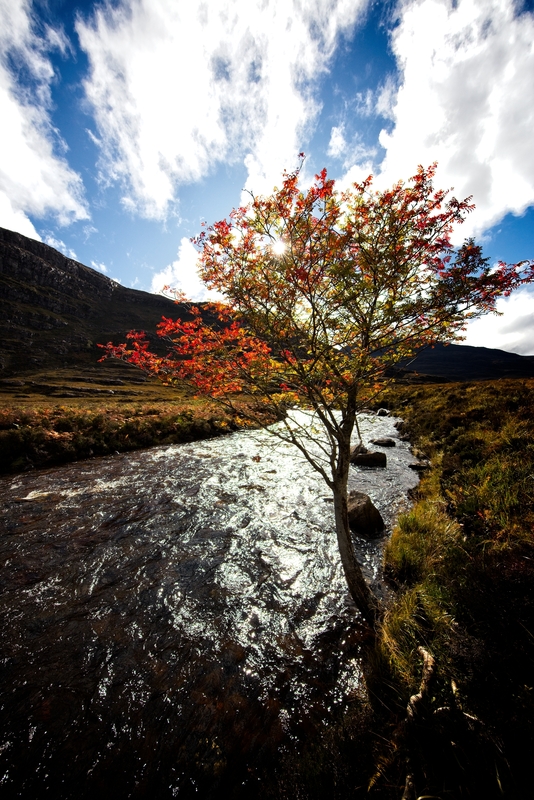 Though the journey over wasn't promising, with showers and low cloud, I was fortunate that much of the cloud lifted and some low autumnal sunshine lit the rich rustic colours that were resplendent throughout Glen Torridon. I was seeking some solitude so kept clear of the well frequented 'honey spots' for landscape photographers with spectacular views on Liatach and Being Eighe. Instead I headed away from the paths, along quite boggy ground, to follow the river as it makes its way down the Glen. My backdrop was the continual sound of flowing water with the occasional bellow from a Red Deer stag preparing for the approaching rut. 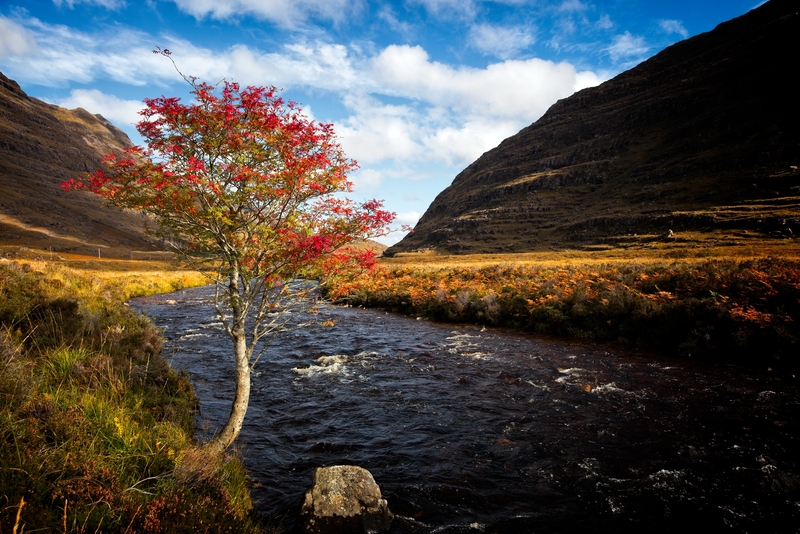 Trees are few in the Glen, the odd group of pine, and also the occasional rowan breaking up the flat valley floor; which is otherwise covered with rough grasses, heather and bracken. It was one such rowan that I focussed on as I was taken both by its shape and its autumn colours. Few leaves had yet dropped and whilst there were still some green leaves many had turned golden or the most wonderful deep red. The low sun only added to the picture with its gentle warm colour bringing out the best in nature's palette. I was also fortunate that the burn had a nice amount of water flowing which also caught the light. The water is nearly always very dark due to the amount of peat that it carries but it still comes to life when sunlight catches the water breaking on the rocks as the river gently tumbles towards Loch Torridon and the sea beyond. 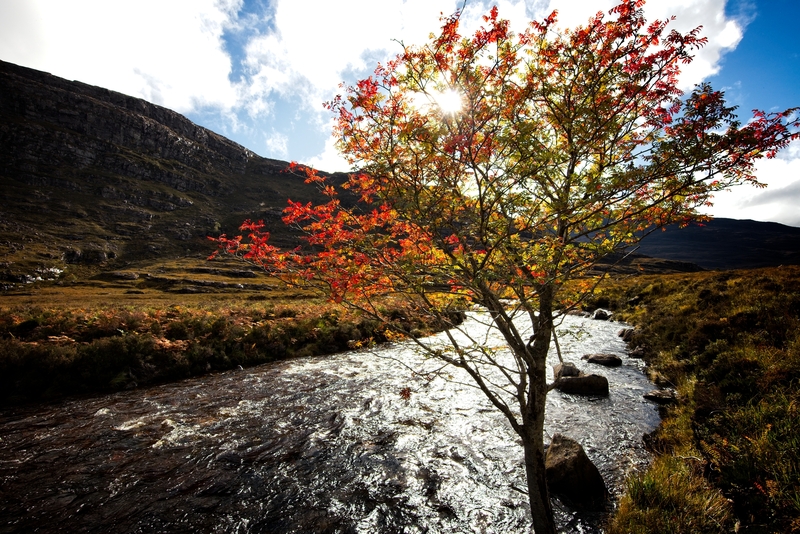 The shorter days of autumn and winter ensure that far too little time can be spent admiring the beauty of the Glen. 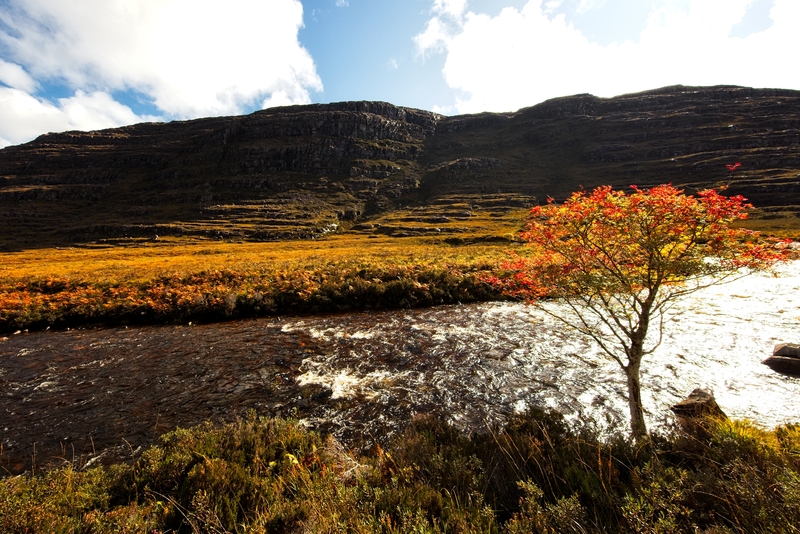 Even though it was only early October the South side of the Glen will now be in permanent shade until late Spring whilst even at mid day the sun was not getting above some of the higher peaks. Nature clearly rationing its jewels for those of us lucky enough to venture from the road and in to its midst.